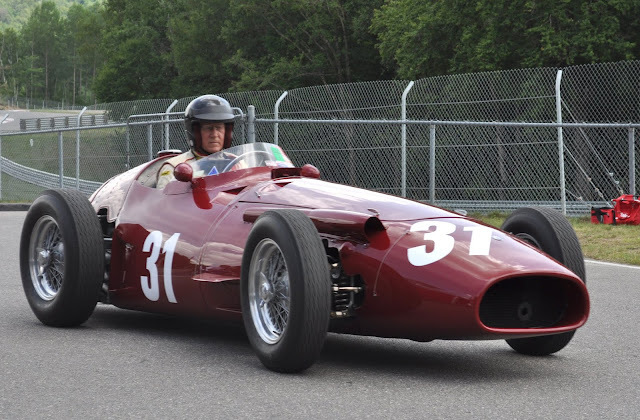 Maserati was a red-blooded racing équipe, if ever there was one! Founded in 1926, it took the team just eight years to become the world's biggest builder of single-seater race-cars. For the first twenty years of its existence, the Maserati marque was devoted solely to racing. By the time it got around to production cars, then, it had learned a thing or two! Certainly, when the 250F hit the track - in 1954 - masses of technical know-how had been already accrued. The car was fully prepared for the rigours ahead! Its straight-six engine was equipped with three twin-choke Weber carburettors. As with most other GP cars of the era, the motor was front-mounted, and powered the rear wheels. To the tune of 185mph! Capacity was 2,490cc. The chassis comprised a tubular frame, independent wishbone/coil spring front suspension, and a de Dion rear axle. And then came a new 250F! Unleashed in '57, it featured a five-speed gearbox, and fuel injection. Power had been upped to 270bhp. The bodywork had been revised. It was now stiletto-sharp at the front ... well, getting on that way! Brakes, too, had been uprated. The 250F was now at the peak of its development. Which was a very good thing - given the talent of the man who would be driving it! Juan Manuel Fangio was already a celebrated driver. This new car would bring him his fifth World Championship. On the way to that, the Argentinian's win in the German GP - at the Nürburgring - has gone down in legend. Peter Collins - in a Ferrari - was the hapless victim of a genius at work. Collins' Ferrari was way out in front ... before Fangio turned up the wick! Four-wheel drifting his 'Maser' with robotic precision, it was but a question of time before he caught up with Collins. As he went by him, it was as if man and machine melded. Probably, it was the finest performance either of them gave - Fangio, or the 250F, that is. Motor racing as science - and sporting endeavour of the highest order. Fortunate, indeed, were those in attendance - that August day, in Germany!